Made from Carbon Steel, these sabers are tough, no frills, and to the point. Balanced perfectly for katas, each saber has a Chromed steel fore grip and thread reinforcement ring, a pebble textured black rear grip, and hooded steel activator plate with rocker switch activator. The blade retention setscrew is a ¼-20 steel alloy Allen screw, cut specifically to lock the blade in place. (Optional Allen wrench sold separately). The blade socket is all steel and approximately 4” deep. Saber takes three AAA alkaline batteries to operate. The pommel is threaded for easy access to the battery pack. These sabers also come with a removable Combat Blade. You pick your LED color, and belt connector. Each saber is made to order. You can mix and match parts to come up with your own design. The base saber price is for a single bladed, straight body hilt and removable Combat Blade. Detailing elements include chromed steel parts, or a single colored paint job over the body plates or body housing. This is a great sound option for your custom saber. We take a brand new Hasbro FX, and convert it into a functional Saber. 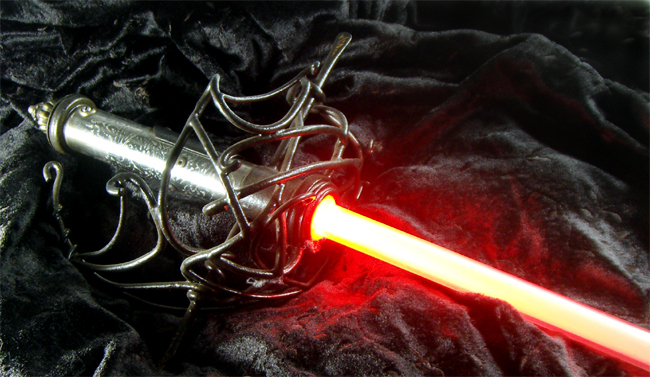 This way you get the official Star Wars sound effects, plus the durability, and a unique one-of-a-kind hilt made to handle a full array of use. These sabers come with a removable Blade. Because these FX Lightsabers are not designed for dueling, the bodies are also modified if you want the original hilt to be used. However, the Hasbro FX Sound System can be customized to fit your own unique saber design. Certain features must be used when using a customized FX sound unit. 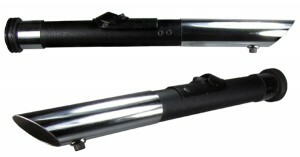 An ergonomic bar activator needs to be used, and it is normally located at the mid-point on the hilt. The pommel ring is hollow to allow sound to exit the hilt. 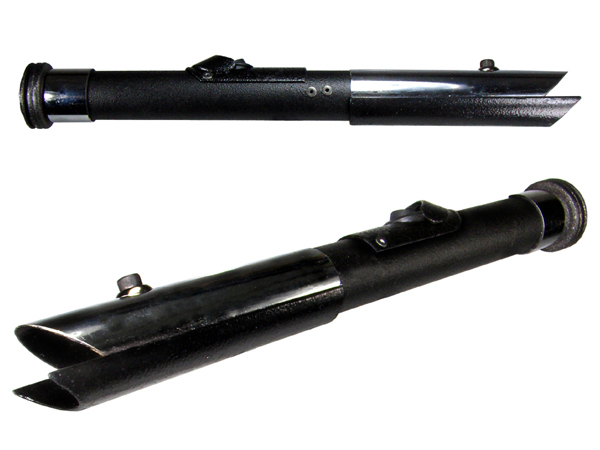 With a full-length socket, the saber will be approximately 13”-14” long. These sound units can be also be put into curved sabers. And due to the size of the battery pack/speaker unit, we only convert Darth Maul and Yoda sized Lightsabers for curved hilts. 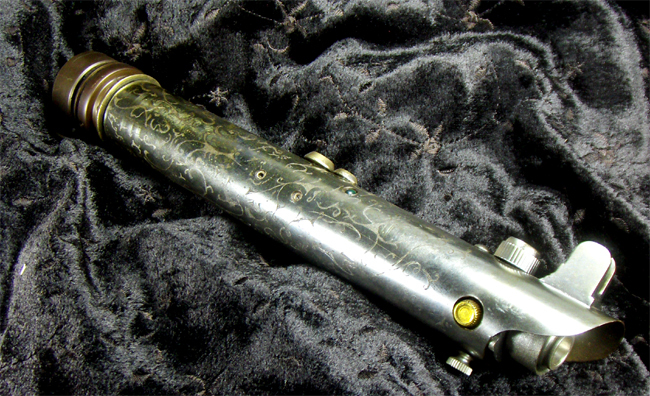 On straight hilts, Obi-Wan, Anakin, and Luke ANH Lightsabers can be customized. 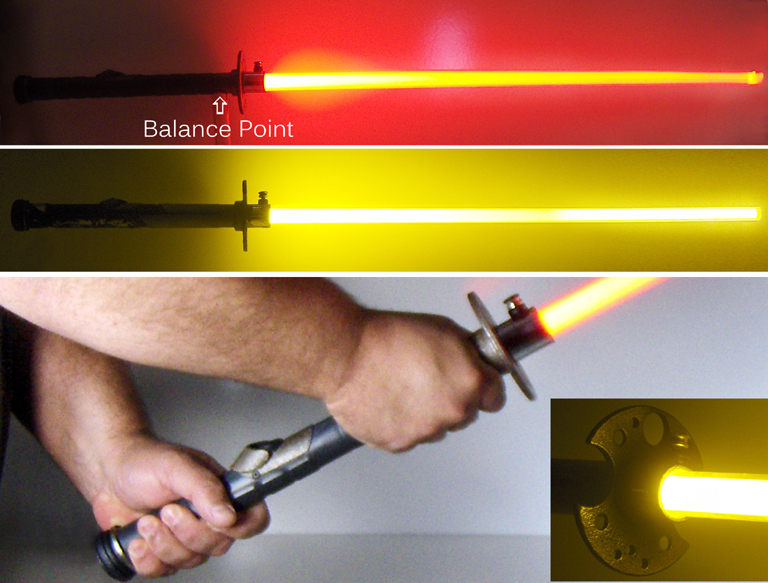 Customized sabers include the same features of our LED Combat Sabers in the base price. Add-on features are extra. Nowhere else will you find this combination of Renaissance with science fiction in light swords. Light weight, all steel and stainless steel, these light-rapiers are both breathtaking and incredible tools. The ornate guard cages are made by hand, from brazed steel rods. The activator is our specially produced internal switch system, allowing you to activate the saber and then grip the short, one-handed hilt completely with your dominant hand. The blade is a slightly flexible ¾” diameter polycarbonate, which mimics the balance and speed of its all steel counterpart, but with safety in mind. One of the disadvantages of practicing with steel blades is that when the daylight fades, there’s no more chance to fight, and they are dangerous to use. But you can keep going if you’re using one of our Light-Claymores, and they are safer than steel. All steel construction on the grip bodies makes them durable and balanced. The cross guards are also made from steel. The heavy double walled polycarbonate blades are 40” long out of the emitter, and slightly heavier than a normal Light Saber blade. The extra polycarbonate in the blade not only makes them even tougher than normal, but makes the overall saber perfectly balanced. The diffusion characteristics also create a glowing core effect, where it appears that a thin beam of light hovers in the middle of the blade. Great as a unique show piece, or something you can take out and put it through its paces. The Light-Katana is the perfect saber option for the person who loves the feel and fighting techniques based on Kenjutsu. The all steel hilt body and steel tsuba make for an excellent hilt and when combined with the thick-walled polycarbonate blade, you end up with a light up bokken or katana with the feel and balance of an all steel katana. 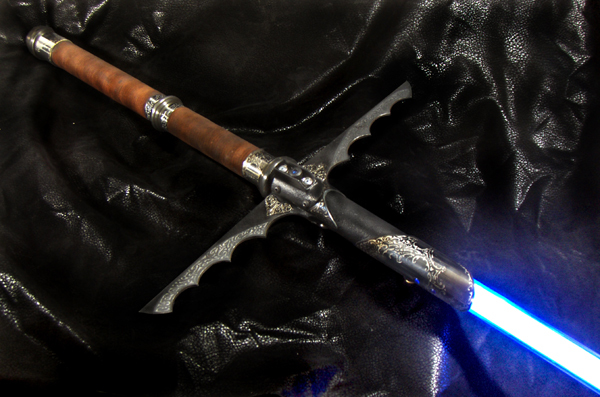 The hilt is generally 11″ to 13″ long with a tight blade socket and a 30″ long blade out of the emitter. The extra deep socket makes for an incredibly solid blade seating. My tsubas run between three and four inches in diameter, which gives your hands great protection. The dimensions of the hilt and blade can be totally customized for you. The balance point on the hilts with the blade attached is right behind the tsuba, making this saber a great tool to use when either performing katas or stunt choreography. Don’t let a cheap aluminum hilt, with poor balance and ergonomics hamper your work outs. Go with one of my Light-Katanas and let your saber techniques reach their full potential. These custom sabers are designed exclusively for use as a collectable or for use on your costume. They cannot be converted into a LED saber or use a Combat Blade. They are made of carbon steel; chrome plated steel, brass, or aluminum. They also have heft, adding to the realism of the prop. The base price is for a straight 12”-14” (black or chrome) hilt, grip plates (black or chrome), button activator, steel pommel (if you so choose). Add-on features are extra. These are some of the most realistic and unique sabers you will ever find. When Advanced Light was first started, the Hyper Realistic Saber was the first product line I made. A real-life weapon is a machine, and to keep a machine in good operating condition, one must be able to field strip it, clean it, maintain it, and put it back together. Well, that’s what a Hyper Realistic Saber is all about; being realistic. They can be easily field stripped into several highly detailed parts, and reassembled. These are great props that will blow you away. While they do not light up, the internal parts make these sabers about as real an object as you can find. The external and internal parts are made from steel and other metals. The sabers usually break down into at least four to five parts. $700 and up (price is dependent upon level of detail and complexity).